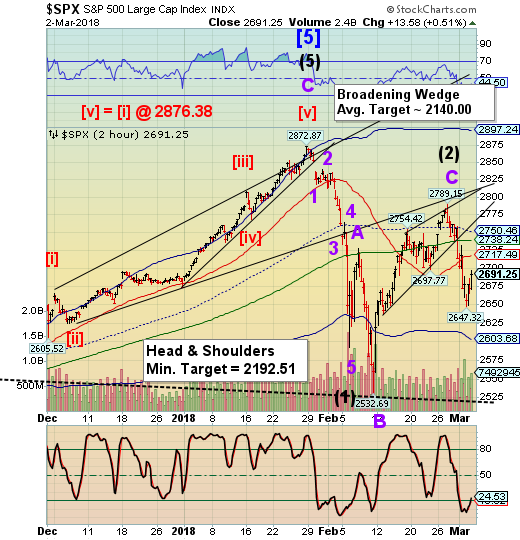 Stock Market SPX 100 Point Drop? SPX futures have started to decline again as of 6:00 am. SPX is on a sell signal, having declined beneath all Cycle supports, including the 50-day Moving Average. Today the Fractal Model suggests a decline of approximately 100 points that should take SPX beneath the Cycle Bottom support at 2603.68. Unless something breaks down, it does not appear that it will take out the prior low at 2532.69. That may complete Wave 1 of (3). From there we may see a bounce back to the trendline near 2675.00. 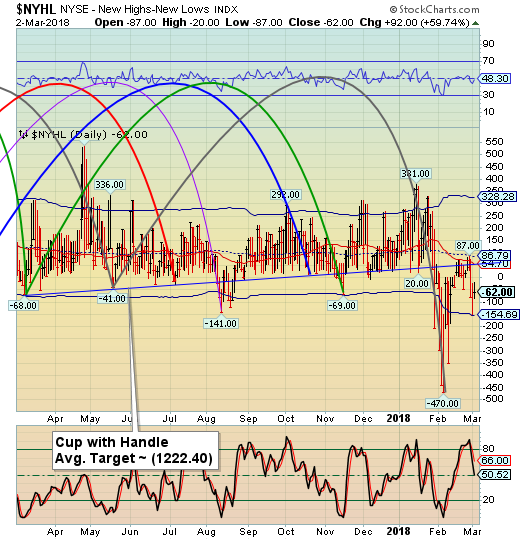 Prepare yourself for some wide swings as the volatility increases. NDX futures are trading flat this morning. It is due to decline to 6400.00 in the next day or two, according to the Fractal Model. Remember that Wave 1 of (1) was the smallest Wave (only 128 points). 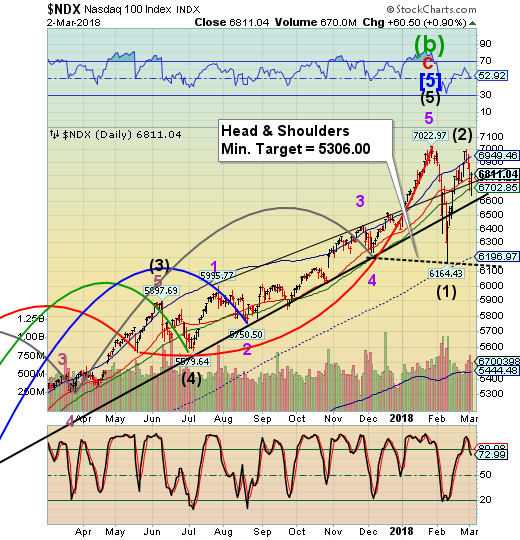 Wave 1 of (3) is set to be nearly 600 points (4.62 times the length of Wave 1 of (1). VIX futures have climbed to the Cycle Top resistance at 20.74 which confirms the buy signal. It may hover in that area for awhile. It seems that VIX may be lagging the SPX at the present time. 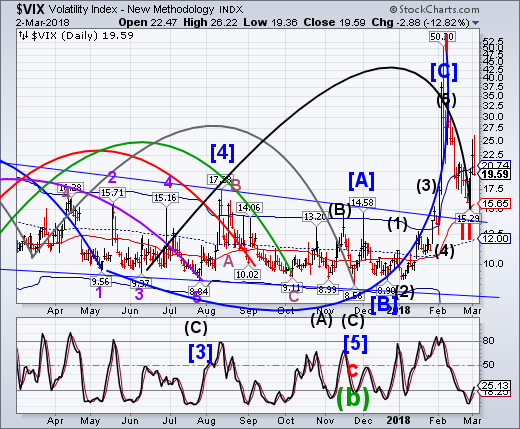 VIX may rise exponentially only after the short volatility positions are wiped out. Charles Hugh Smith comments, “One of the greatest con jobs of the past 9 years is the status quo's equivalence of risk and volatility: risk = volatility: so if volatility is low, then risk is low. Wrong: volatility once reflected specific short-term aspects of risk, but measures of volatility such as the VIX have been hijacked to generate the illusion that risk is low. But even an unmanipulated VIX doesn't reflect the true measure of systemic risk, a topic Gordon Long and I discuss in our latest program, The Game of Risk Transfer. TNX futures are declining this morning. It is likely that TNX may continue to decline over the next three weeks. The NYSE Hi-Lo Index is on a sell signal, so we have reassurance that the decline may continue. USD futures are rising this morning. Remember that a sell-off in stocks may increase the demand for dollars, despite its weak appearance. 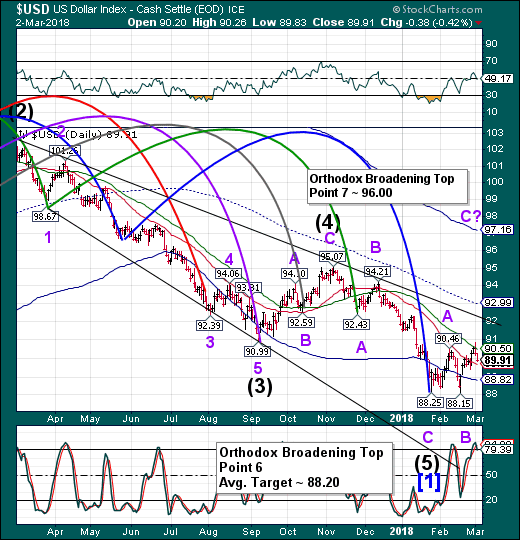 The Orthodox Broadening Top, which is visible on the weekly chart, suggests a rally to 96.00 over the next two to four weeks. 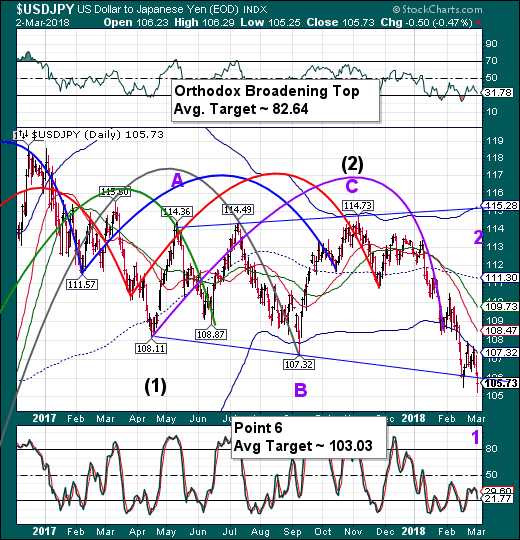 It may push to the Cycle Top which is currently at 97.16, but declining. USD/JPY continues its decline, despite the USD rally. That is primarily due to the Yen acting as a safe haven for investors fleeing the declining equities markets. 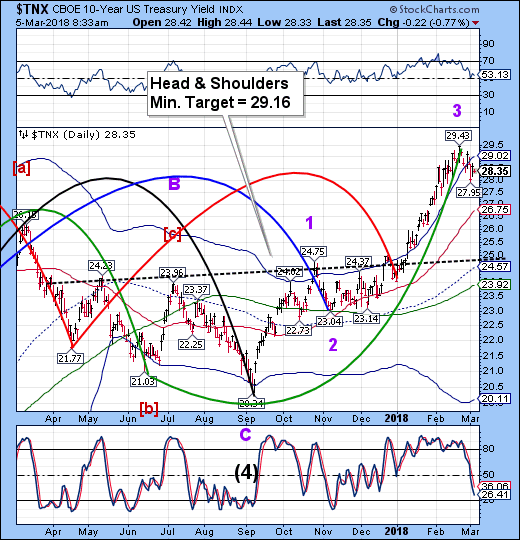 It, too may rally, but not until it reaches “point 6” which appears to be near 103.00.
Commodities are flat this morning, but may also resume their declines soon.